My Simply Straight Brush Review: Is It Worth It? Have you seen the new Simply Straight Ceramic Hair Brush? It’s a new product and after seeing the TV commercial, I found it intriguing. Being an addict to straightening my hair and always looking for something new and exciting I decided to try it. 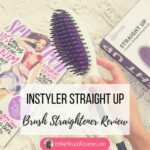 This article includes my full review of the Simply Straight Brush and my personal experience using it. 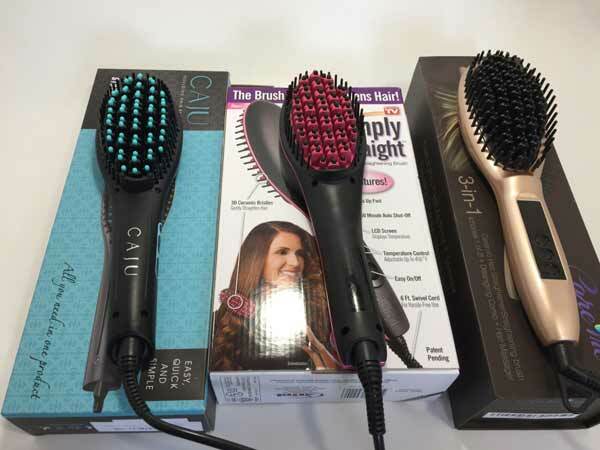 I’ve also tested other brush straighteners: Apalus Brush Straightener, the Caju Brush Straightener and the Asavea Brush Straightener, so I hope this Simply Straight brush review will provide a new perspective when comparing it vs peer products available on the market at similar price range. What Is The Simply Straight Brush? What Does The Brush Do? What Hair Type Is The Simply Straight Ceramic Hair Brush Suitable For? One of the latest hairbrush hot tools, the Simply Straight Ceramic Hairbrush is certainly not the first one to hit the marketplace. These heated hairbrushes have been available for a couple of years and every new generation brings a better, up-to-date hair tool with added benefits and improved results. The Simply Straight Brush is available at an affordable price point. At that price point you get essentially a new-generation straightening tool. It looks rather like a large hairbrush and is coated with ceramic. The bristles are also ceramic and there’s a plastic-coated handle. Attached to the handle is the cord which plugs in to a nearby outlet. The brush handle has switches which control temperature and switch the hair tool on and off. The brush promises to straighten the hair and banish the risk of heat damage while doing so. I do agree that straightening brushes are safer to use on hair than traditional straighteners with plates but as with every single hair tool, you should use a decent quality hair protection spray or similar before styling. What is especially good about these straightening brushes is that it doesn’t press your hair together, rather it glides over hair using its heated bristles and body to smooth and straighten. This brush is also suitable for thick, long hair (including Afro hair types) as it reaches a high temperature (up to 185 degrees Celsius). High temperature of up to 450 degrees F.
Cool setting to create waves. 185 different temperature settings, suitable for all hair types. Auto shut-for safety (after 30 minutes lying dormant). Compact design, ideal for travel. 180 second heat up time. I firmly believe that this brush is suitable for all hair types as long as it is used properly. So if you have thin, fine or damaged hair don’t set it at a very high temperature and always use heat protection spray or similar before styling. Don’t go over and over the same sections of hair either as this puts hair under pressure and causes damage. Thicker hair can take a higher temperature but even if you are blessed with very thick hair, you should also use a good heat protection spray. What you can expect is speed. It works really quickly on my shoulder length hair. The ceramic brush lifts hair from the root so it doesn’t leave it too flat either. You should section out the back of your hair because you may miss the underneath and get kinks. So start with the underneath and work your way to the top layer of hair. I didn’t think my hair was as sleek and shiny as it said it would be but I used some serum afterwards to get the shine I wanted. 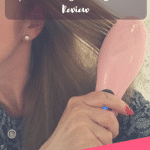 I would use this straightening brush when in a hurry and it’s great to pack away and take to the gym for example, when you want to get out quick! Inexpensive (other similar models are vastly more expensive). Fast and easier to use than other straighteners because you glide it through the hair. So there’s no need to keep putting sections in-between plates. Compact, so it’s ideal for traveling or using on the go. Excellent for achieving a completely straight look (see my results below for more detail). Extremely easy to use, just brush! Works quickly, just ten minutes for my medium thickness hair. Great for when you’re in a hurry! I love the auto-shut off because I can be quite forgetful so no fear of the product over-heating. LCD display screen so you can see the temperature display. Cannot be used on wet hair. So you have to dry hair off first (although this is the same disadvantage traditional straighteners have). Slow to heat up – 180 seconds (3 minutes). Other hair tools heat up in one minute. It does feel heavy after a while, would be better if it was lighter in weight. It can snag hair. To avoid unwanted snagging and pulling, brush hair thoroughly before using. It is difficult to get body out of this brush as it makes hair look very flat. However, you can get some lift if you pull upwards with the brush before traveling down the length of your hair. Doesn’t get hair as shiny as when using a traditional set of hair straighteners. 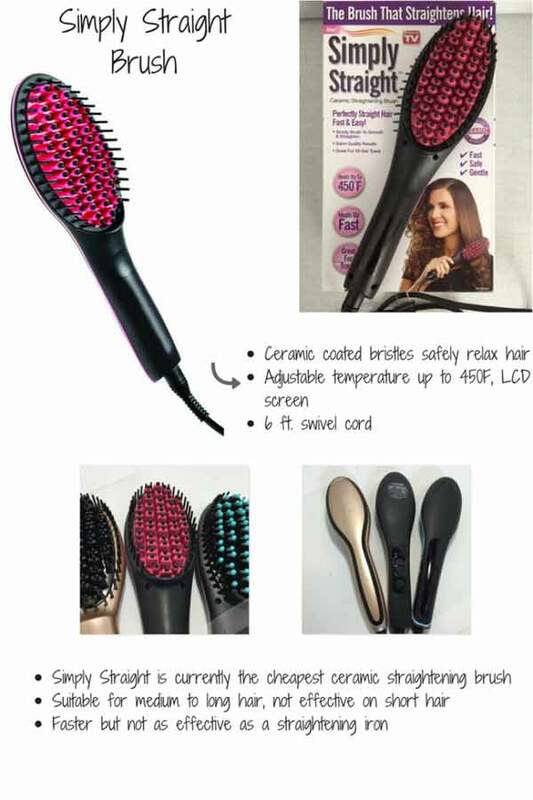 Despite using a lower temperature, it is very hard to achieve a wave in hair using this brush. It’s difficult to use on very thick hair because it doesn’t seem to reach all the way through, hence the importance of really sectioning out hair to make sure there aren’t any non-straightened areas left. If your ends need trimming, this brush really shows it because it’s hard to tuck hair under or flip it using this brush. There are hair straighteners of course and they’re a good bet for straight shiny hair but they’re harsher on hair than the new-breed straightening brushes. I would definitely avoid traditional straighteners if I had fine, thin or damaged hair and opt for a straightening brush instead. There’s also the good old fashioned hair dryer which gets hair straight, but it takes longer and it’s harder to achieve salon-finish shine unless you’re a trained hairdresser. There are also other hair straightening brushes on the market. I’ve included a comparison of other popular straightening brushes vs the Simply Straight Brush. Both brushes look very similar. The Dafni straightening brush was the first straightening brush to come to market and the Dafni brush is a tried and tested hair tool. The Simply Straight Brush is designed to straighten curly, wavy or frizzy hair fast using heated bristles. The Dafni is designed to deliver similar results. Major differences between the Dafni brush include a faster heat up time and higher quality materials. Dafni’s brush includes patented technology designed to ensure higher quality material with a longer useful life. The Dafni brush is a well-constructed piece of technology and straightens quickly, usually in one pass (as does the Simply Straight). Both brushes include ceramic coated bristles and distribute heat evenly. Dafni represents a high quality brand name option so it does include a higher price point than the Simply Straight Brush. 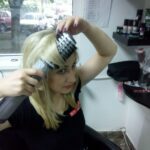 For a full review of the Dafni Straightening Brush, click here. The Apalus represents another version of the straightening brush and offers a slightly lower price point than the Simply Straight Brush. The main difference is the newest generation of the Apalus is slightly different in shape, as it’s more rectangular. Earlier earlier versions of the Apalus straightening brush were rounded, like the Simply Straight Brush. The Apalus also has a massager function that stimulates the scalp so it boasts an extra function than the Simply Straight Brush. The massage function also emits negative ions which deliver shine, something that a lot of straightening brushes fail to do. Like the Simply Straight Brush, the Apalus is made out of ceramic with plastic. However, the Apalus brush offers higher temperatures, up to 446 degrees F, so it copes better with very thick, coarse hair. With a variable temperature, Apalus is also suited to all hair types. Like the Simply Straight Brush, the Apalus also has auto shut-off (after one hour of dormant use) and its dual voltage means you can use it when traveling. It’s difficult to choose between the Simply Straight and the Apalus because they deliver similar results. However, if you have very thick, coarse hair I would suggest the Apalus simply because it achieves a higher temperature. For a full review of the Apalus straightening brush, click here. The Asavea straightening brush is available for a very similar price as the Simply Straight Brush. On the surface, both look very similar, however the Asavea brush offers a different color. The Asavea brush feels very solid though and the black color is sleek. The Asavea brush temperature is displayed on an LCD screen and it reaches up to 446 degrees F, so it’s a great bet if you have very thick hair. The cord rotates, making it very easy to style at the back and it comes with its own travel case. All in all, both straightening brushes are very similar to each other and any of them make good choices. It looks like a regular hairbrush except it has a cord which you plug into an electrical source. The idea is that it straightens hair out as it brushes. It’s not like the air stylers though so you can’t use this on wet hair, hair must be dry first. Wash it, dry it and apply a heat protecting spray, although the ceramic technology promises sleek hair without frizz which is always a bonus. I found the brush easy to use, but I felt it took too long to heat up. My hair is relatively thick and just past my shoulders, but it is very dry hair and I am very careful with it, tending to use heated hair tools sparingly. I followed all the steps as I listed above. They are what I usually do if I’m using a hot hair tool that can’t be used on wet hair. As a general rule, when blow drying my hair with a hair dryer it takes around 40 minutes to achieve my style. I do like body though. The problem with this hair brush was that it did straighten my hair quickly, but it straightened it too well and I felt I had lack of movement and flat hair that didn’t do much. However, if you’re looking for very straight hair, this hair straightening tool will tick the box, me? I prefer my hair with body…! I must say though, my hair was still straight the next day, after going out at night and then sleeping on it! If you’re just contemplating getting a brush straightener and you don’t know which would work best for your hair type, just take a look at our Complete guide of hair straightening brushes for each hair type. I was skeptical, but the commercial was believable and I said I can buy it at Wal-mart and if it doesn’t work right I can return it…I bought it and truly it DID WORK like they said and in half the time as a hot iron. I love it and not returning it! Thanks Simply Straight. Hi Sheri, very happy it worked for your hair type, thanks for stopping by and for letting everybody know how it went for you! I just got one and it works! 16.00 at TJ Maxx! My Chi takes a long time to use and this is quick! I have shoulder length, medium fine hair that is straight but i get wavy and frizzy in the humid weather. It truly took about 5 minutes to do my hair! Love the LCD display and different heat settings! Glad it worked for you! That’s a really great deal! I LOVE mine. Mine heats up VERY QUICKLY. Perhaps yours was a lemon. Mine is hot before I’m done sectioning my hair. I don’t like the placement of buttons however, as I’ve inadvertently shut my brush off during styling. But that’s a small price to pay for this miracle worker. Oh where were you in the ’70s when I needed you!